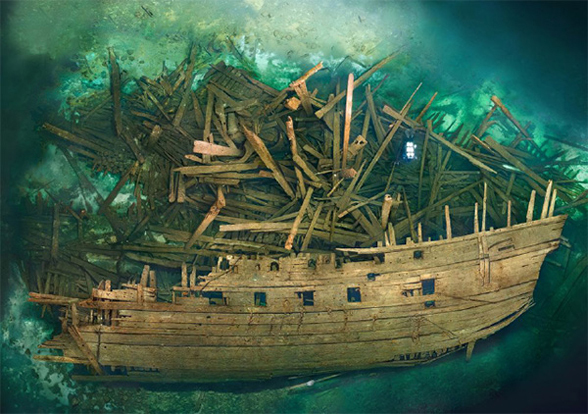 This photo an 16th century galleon in the Baltic reminded me that similar crushed fossils sometimes provide more data at a glance than first meets the eye. Figure 1. A sunken flattened ship is like a sunken flattened pterosaur fossil. Here the lateral view is easy to see and the dorsal view can be reconstructed from the loose planks. Here is the R156 specimen of Dorygnathus about to eat a displaced femur. Figure 2. The R 156 (Uppsala) specimen of Dorygnathus. Crushed and scattered like a sunken galleon. 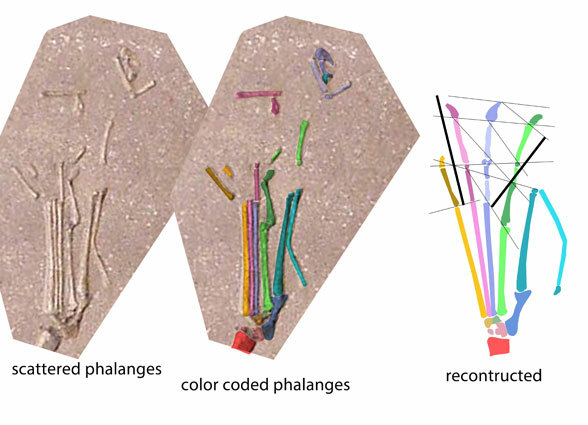 And here is how the displaced ‘planks’ (in this case, phalanges) can get put back together using DGS (digital graphic segregation) techniques: colorizing the bones then moving the colors into a reconstruction, checking with PILs. A little intuition and experience also helps. Figure 3. The disarticulate pes of Dorygnathus here reconstructed using DS into a complete pes. Wondering now whether or not those metatarsals were splayed or appressed when walking. Figure 1. The new Jianchangnathus(?) compared to the holotype. The new one has a quite broad cranium and an antorbital fenestra that extends below the orbit, unlike the holotype, but like Scaphognathus. Other differences are just as obvious. 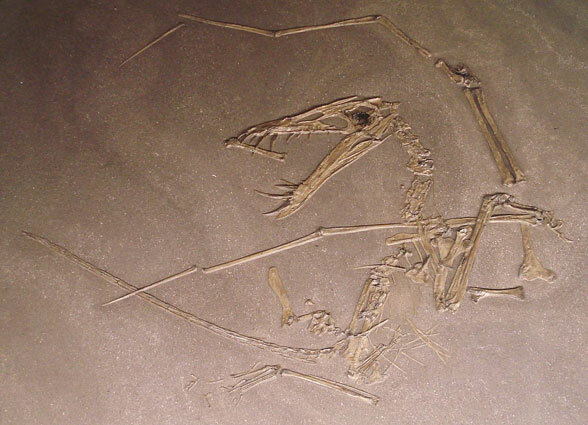 A new pterosaur PMOL-AP00028 (Zhou 2014) has been attributed to Jianchangnathus IVPP V 16866, Cheng et al. 2012), but that does not seem warranted in this case. The comparable traits are not close matches. Zhou did not make graphic comparisons of the holotype and referred specimen. Rather the two specimens were combined then compared to other rhamph-grade taxa as illustrated by Wellnhofer (1991 and earlier). I think a step or two was skipped in Zhou 2014. Based on the orbit overhanging the antorbital fenestra, the closer match might be to Scaphognathus itself, which was close to the size of the referred specimen. Zhou C-F 2014. 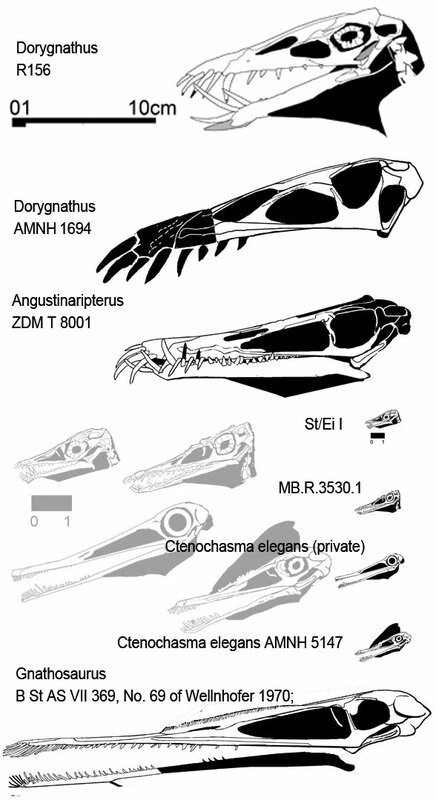 Cranial morphology of a Scaphognathus-like pterosaur, Jianchangnathus robustus, based on a new fossil from the Tiaojishan Formation of western Liaoning, China. 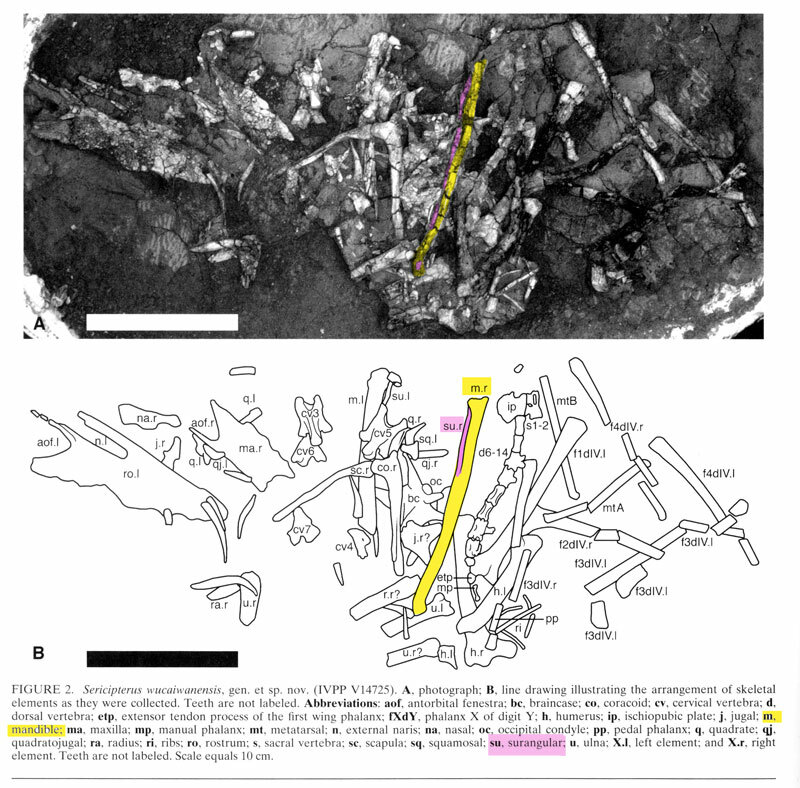 Journal of Vertebrate Paleontology 34(3):597-605. If it is one, it’s a big one! Wingspan estimates are over a meter. Of course, this flies in the face of the large pterosaur tree, which recovered four origins for pterodactyloid-grade pterosaurs at about this same time, and they were all tiny. Andres, Clark and Xu did not include these tiny pterosaurs in their phylogenetic analysis. Figure 1. 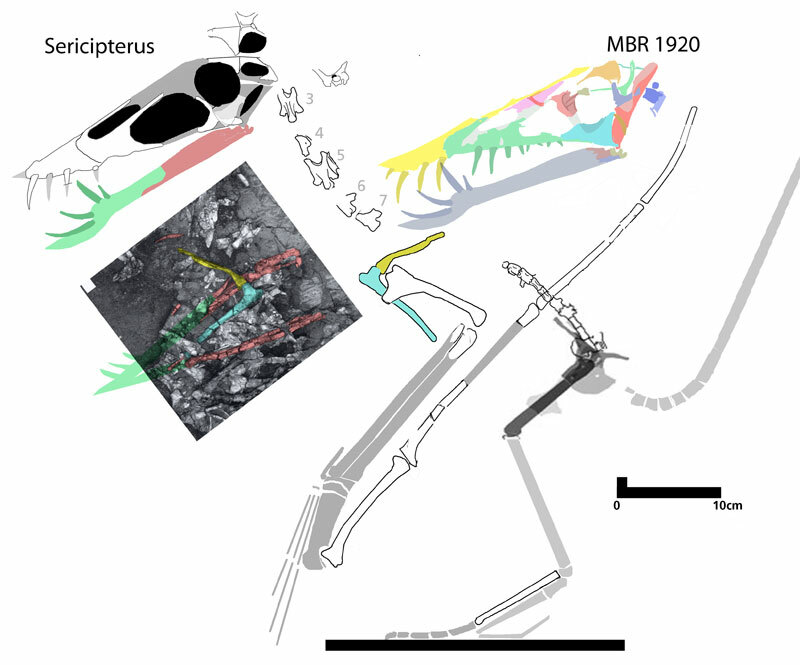 The bits and pieces of Kryptodrakon assembled into a Pterodactylus bauplan, from Andres, Clark and Xu 2014.
but not impossible. Andres, Clark and Xu did that above (Fig. 1), using a small Pterodactylus as their bauplan or blueprint. and it’s also from the same Shishugou Formation. Sericipterus is a very large and gracile dorygnathid (Fig. 2). When you put the bones of Krypodrakon on top of the bauplan for Sericipterus you find a good match. Figure 2. Here the bone bits of Kryptodrakon are placed on the bauplan of the giant dorygnathid, Sericipeterus, also from the Shishugou Formation. There’s a good match here. Perhaps Kryptodrakon is a junior synonym for Sericipterus, filling in some of its missing pieces. And suddenly that “long metacarpus” is not so long anymore. Notably, Sericipterus had gracile wing bones, and that proved confusing to Andres, Clark and Xu. “Thinner” can sometimes be confused with “longer” unless you know what the bauplan is. Kryptodrakon and Seripterus are both from the same formation. They are the same size, and their bones have the same shape (so far as can be told from available scraps). We also know from a larger phylogenetic analysis that includes tiny pterosaurs that basal pterodactyloid-grade pterosaurs were all tiny and Kryptodrakon was big. the more parsimonious solution is to consider Kryptodrakon a junior synonym for Sericipterus, a giant dorygnathid, not a pterodactyloid. 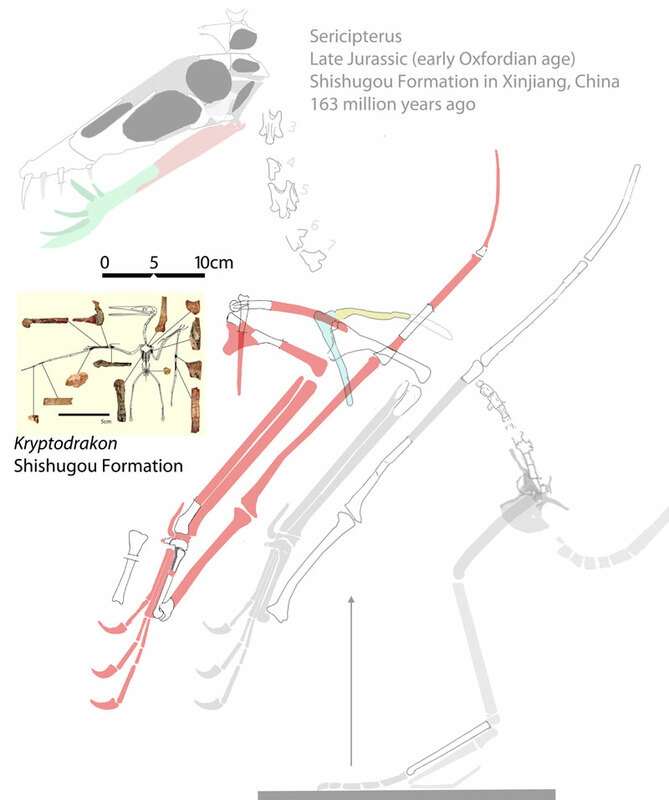 Andres, Clark and Xu were also the discoverers and authors of Sercipterus, the only other pterosaur found in the Shishugou Formation. Sorry to throw cold water on this. But testing for parsimony is good Science. I made a mistake here earlier today, and within just a few hours, I am able to correct it. So what you are about to read here has been thoroughly rewritten to reflect the latest thinking. Earlier I misidentified what looked like a too gracile mandible (relative to the other skull parts) on the pterosaur, Sercipterus (Figs. 1-3), as a tibia and fibula. Here is the illustration in which I made the mistake (Fig. 1). And made a further mistake by calling out the original interpretation as an error. Figure 1. Click to enlarge. From Andres et al. 2010, where they identify a mandible and surangular. I thought it odd that it would be preserve narrow edge up, and where are the teeth or their alveoli? But now i see the reason for this. Read on. At the time I overlooked the left mandible. It’s easy to do. There’s not much that makes it look like a mandible. The back half is all that is preserved. The left mandible appears to be a little deeper, which it needs to be according to phylogenetic bracketing. Allthough the fossil had been thoroughly stirred during preservation so that nothing is where it was in the living pterosaur, there are two bones that are indeed in their original configuration: the two posterior mandibles (Fig. 2, in pink). How can this be?? Figure 2. When you use your imagination, and a little Photoshop, you can restore the front of the mandible. What we’re seeing here is the ventral view, so no teeth are visible. The reason why the posterior mandibles remain in their original edge-on configuration is due to the front of the fused mandibles, now vanished. The entire mandible was originally preserved in its flattest plane. And that’s why the right mandible remains narrow end up. Restoration of the missing parts clears up all the confusion. When you extend the lines of the posterior mandible, the anterior portion becomes plainly visible. Now we have a mandible that is the proper length for the skull parts (actually it elongates the earlier restoration of the skull and suggests a larger antorbital fenestra than in other dorygnathids, Fig. 3). And now the narrow mandible makes sense because it is not preserved in lateral view. Figure 3. New reconstruction of Sericipterus with restored mandible in lateral view based on the related MBR 1920 specimen, in color at right. but that’s not the thought you should take-away from this exercise. Science doesn’t work on trust. It works on testing. Having never seen a mandible preserved edge-on in the matrix, without obvious alveoli and too gracile for the skull, I sought another explanation for the questionable portion of the fossil. The tibia/fibula seemed to be a good fit. But I was wrong. The mandible was not preserved edge-on, but flattened along its widest dimensions, like most fossils are. Then the anterior half of the fused mandible was lost leaving the posterior parts edge-on. Now it makes sense. It would have helped if the above restoration was made prior to publication. I’m sure you can see how well it illustrates the situation here. Making mistakes is one way to shed new light on a problem. I never would have arrived at this solution and explanation had I merely trusted the original authors. When something doesn’t make sense, keep working on it until it does makes sense. It’s a process. And I’m always glad to accept any help that is offered. Getting it right is the ultimate goal. Andres B, Clark JM and Xing X 2010. A new rhamphorhynchid pterosaur from the Upper Jurassic of Xinjiang, China, and the phylogenetic relationships of basal pterosaurs, Journal of Vertebrate Paleontology 30: (1) 163-187. Angustinaripterus (Fig. 1) has been difficult to classify for other pterosaur paleontologists. Here in the large pterosaur tree the reason becomes quite evident. Add a few taxa and Angustinaripterus become a transitional taxon between the more primitive Dorygnathus (R154) and the more derived Gnathosaurus and Ctenochasma. Figure 1. Angustinaripterus as a transitional taxon between Dorygnathus and Gnathosaurus. Seems pretty obvious. Phylogenetic analysis confirms. This possibility flips out traditional pterosaurologists who have pinned their hopes on Darwinopterus, which doesn’t look much like either Ctenochasma or Dorygnathus. Here (Fig. 2) are the many other specimens that smooth the evolutionary transition, as we noted before. Here they are. And many of them are tiny. Figure 2. The same sequence with the addition of Dorygnathus purdonti and four tiny pterosaurs variously misassigned to Pterodactylus and Ctneochasma. Black illustrations are to scale. Gray figures are enlarged to show detail. Angustinaripterus is the reason why I delved deeper into pterosaur phylogeny than anyone has done before. At first glance it’s clearly something not quite Dorygnathus and not quite Gnathosaurus or Ctenochasma. This (Fig. 2) is only one sequence of many in which tiny adult pterosaurs are transitional between larger forms, both more primitive and more derived. At first glance, and according to tradition, these tiny pterosaurs are only juveniles or hatchlings, which makes perfect sense—until you add them to your matrix—and you realize juvenile pterosaurs of other types are virtual copies of adults. So there was no allometric growth after hatching, but chiefly isometric growth. But there’s an important clue here staring you right in the face: Note how the tiny pterosaurs are ALL the same size. As it turns out, this is the minimum size at which pterosaurs could fly, evidently, as we find no smaller pterosaurs in the fossil record. Smaller pterosaurs, all juveniles, must have been living in damper environments and probably not flying. Some hatchlings, like the IVPP embryo, were as large as these adult pterosaurs (Fig. 2) and other adult tiny pterosaurs, so they could fly immediately. He X-L, Yang D-H and Su C-K 1983. 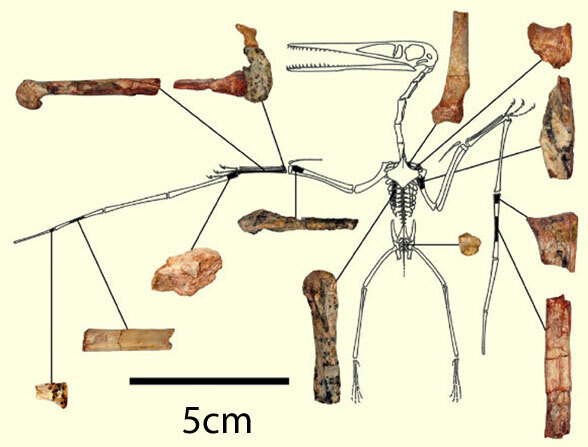 A New Pterosaur from the Middle Jurassic of Dashanpu, Zigong, Sichuan. Journal of the Chengdu College of Geology supplement 1: 27-33. Kevin Padian (2008) on Dorygnathus banthensis represents the latest traditional thinking on this genus and species. We’re expanding on that with multiple reconstructions and a phylogenetic analysis, both lacking previously. Yesterday was part 1. Figure 1. Click to enlarge. Rhamphorhynchus and Dorygnathus compared. Here we see basal taxa and middle of the evolutionary sequence taxa. R has a larger sternal complex, smaller antorbital fenestra, longer m4.1 and shorter neck in all cases. The other distinctions are less obvious. Dorygnathus (Fig. 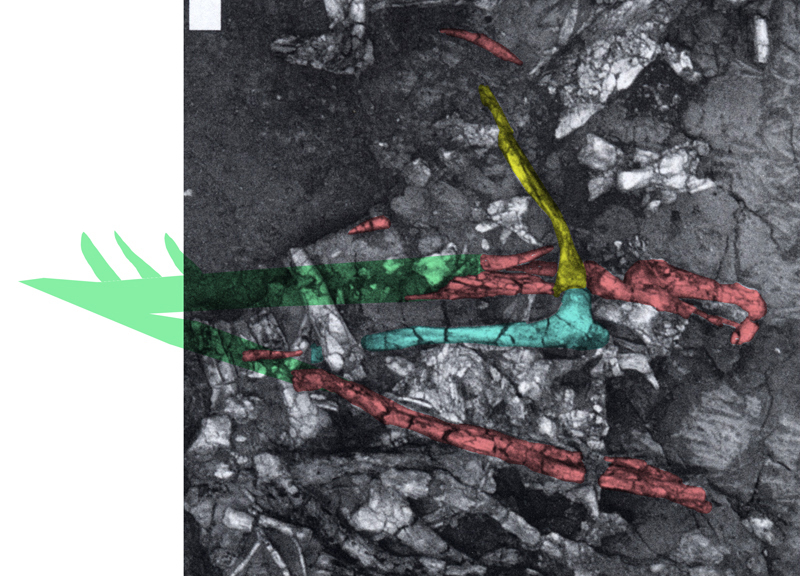 1) and Rhamphorhynchus both shared big procumbent teeth by convergence. 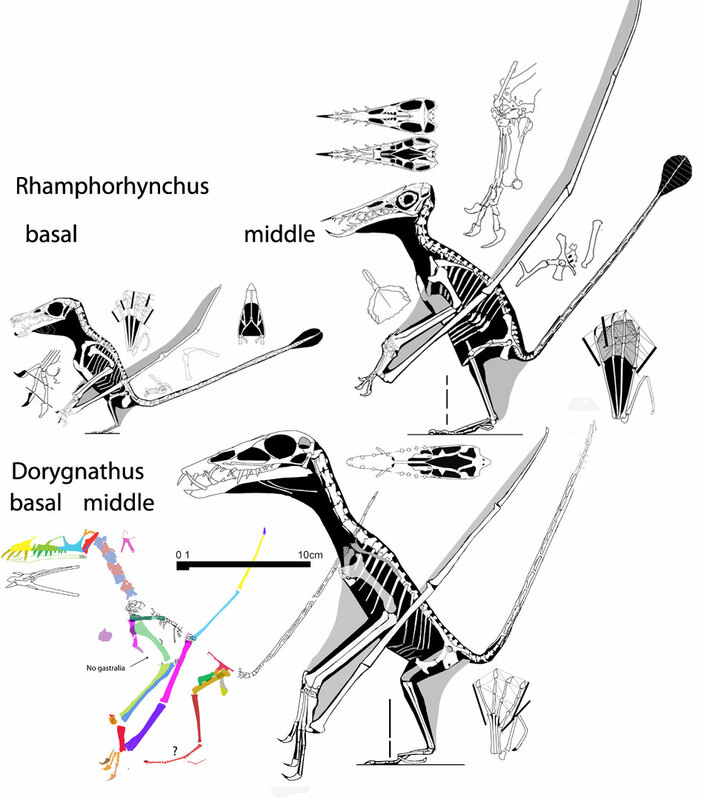 Whereas Rhamphorhynchus is known from several sizes (falsely considered ontogenetic by those who have not performed a phylogenetic analysis on clade members), Dorygnathus is not well known for size differences (Fig. 2), but there are some small ones and large ones. Sericipterus (Andres et al. 2010, Fig. 2) is larger than the others, but it is not considered congeneric. Andres et al. (2010) considered it closest to Harpactognathus and Angustinaripterus (Fig. 2), both pre-ctenochasmatid dorygnathids. Their tree found these three taxa and Cacibupteryx to be derived from a sister to Dorygnathus, which is duplicated in the large pterosaur tree, only with more intervening and related taxa. Curious, I wondered if the small “Hauff” specimen would nest with one of the other larger specimens and so be considered a possible juvenile. So I ran the analysis. Instead, the Hauff specimen nested at the base of the clade, derived from a sister to the equally small Sordes (Fig. 1). This is not unexpected, but follows size patterns seen in most, if not all, major pterosaur clades with smaller specimens at the bases of distinct clades and genera. This went unnoticed in Dorygnathus until now. Figure 2. Click to enlarge. Reconstructions of several Dorygnathus and related taxa based on tracing bones. Here they appear to be several distinct species and certain other pterosaurs appear to be congeneric (depending if you’re a lumper or splitter). This is confirmed by phylogenetic analysis. One branch of dorygnathids is basal to ctenochasmatids. Another is basal to azhdarchids. A third, more basal clade, not far from Sordes, is basal to scaphognathids and darwinopterids, represented here by Jianchangnathus. So Dorygnathia survived to the Maastrichtian. A small one, the Hauff specimen, is basal. There is also a clade leading to a large Sericepterus that did not lead to other clades. The variety here is comparable to the Rhamphorhynchus clade. SMNS 558866 is also small (Fig. 1), but nests between two larger specimens. While sharing many traits with all other Dorygnathus specimens, it appears to have a unique morphology, so is not a juvenile of the R156 specimen or Cacibupteryx. So no juveniles here!! (Same as in Rhamphorhynchus, they’re growing up in damp leaf litter far from ancient Geman seas). I would have liked to have discovered some juveniles here, but you have to let the data do the talking. To lump? Or to split? The Dorygnathus clade suffers from the same nomenclature problem that other pterosaur clades suffer from. Several professionally named “Dorygnathus” are phylogenetically separated from one another by more recently named novel genera. No prior phylogenetic analysis including more than one Dorygnathus was ever attempted before. That’s the main problem. As you can see, there is variety within this clade that was previously overlooked. There is no more and no less variation here in Dorygnathus than in the present Pteranodon, Pterodactylus, Germanodactylus, Rhamphorhynchus, Eudimorphodon and other wastebasket taxa. Someday a grand poobah will straighten this all out for us and have his authority respected. I don’t care if the lumpers win or the splitters win, but the tree has to be acknowledged agreed upon before we get down to naming genera again. It’s getting very confusing out there. Tomorrow we’ll talk about Dorygnathus’ most embarrassing trait, that tiny sternal complex. Andres B, Clark, JM and Xing X 2010. A new rhamphorhynchid pterosaur from the Upper Jurassic of Xinjiang, China, and the phylogenetic relationships of basal pterosaurs’, Journal of Vertebrate Paleontology, 30: 1, 163-187. Padian K 2008. The early Jurassic pterosaur Dorygnathus banthensis (Theodori, 1830). Special papers in palaeontology 80: 64 pp. Kevin Padian (2008) on Dorygnathus banthensis represents the latest traditional thinking on this genus and species. Unfortunately he did not reconstruct more than one specimen (Fig.1) and he did not employ phylogenetic analysis neither between specimens nor between other pterosaurs. Those shortcomings are rectified here. This post was inspired by the addition of three new Dorygnathus specimens to the cladogram (Fig. 2 in color). Figure 1. Padian’s (2008) version of Dorygnathus taking off. This is a freehand sketch, not a tracing of bones (as in Figs. 2, 3). Padian did not attempt to reconstruct more than one Dorygnathus to test the supposition that there are over 30 specimens of this one genus and species. Nor did he attempt a phylogenetic analysis. Reconstructions (Fig. 2) illuminate the subtle and not so subtle variations. Padian’s bipedal pterosaur appears to be in an attack mode. I’d like to see him draw Dorygnathus in a common pose of balance. Figure 2. Click to enlarge. Reconstructions of several Dorygnathus and related taxa based on tracing bones. Here they appear to be several distinct species and certain other pterosaurs appear to be congeneric (depending if you’re a lumper or splitter). This is confirmed by phylogenetic analysis. One branch of dorygnathids is basal to ctenochasmatids. Another is basal to azhdarchids. A third, more basal clade, not far from Sordes, is basal to scaphognathids and darwinopterids, represented here by Jianchangnathus. So Dorygnathia descendants survived into the Maastrichtian. A small one, the Hauff specimen, is basal. There is also a clade leading to a large Sericepterus that did not lead to other clades, but became extinct. The variety here is comparable to the Rhamphorhynchus clade. 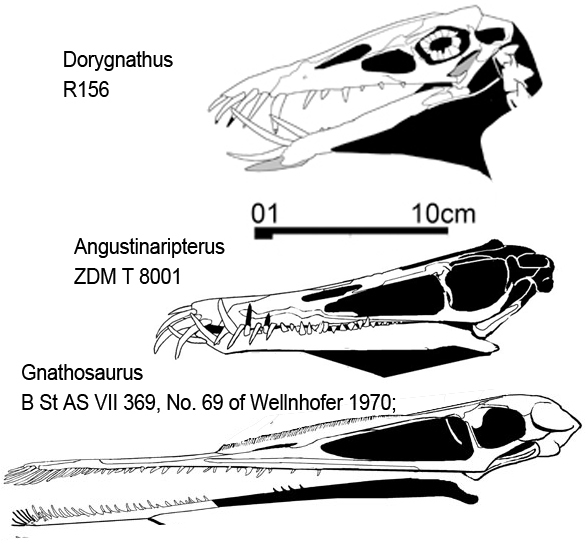 Reconstructions of several Dorygnathus specimens (Fig. 1) reveal an overlooked variety in this genus that does not become readily apparent until accurate tracings and reconstructions are made. These specimens do not appear to be conspecific, confirmed by phylogenetic analysis. Each has at least a few distinct traits. 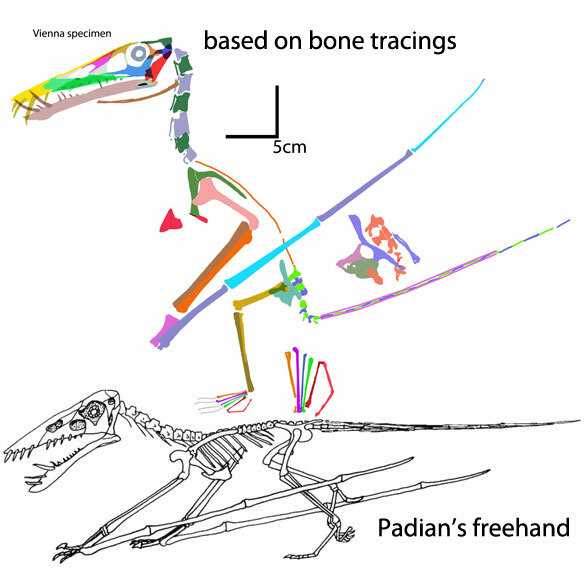 While most specimens were about the same size, each had a distinct morphology with longer and shorter skulls, different sized fingers, distinct sternal complex and pelvis shapes and distinct pedal proportions. According to the large pterosaur tree, Dorygnathus descended from a sister to Sordes and Changchengopterus, both smaller specimens. To Padian’s point: Dorygnathus is a key taxon at the base of two pterodactyloid-grade clades: ctenochasmatidae (which retained long teeth) and azhdarchidae (which did not). Dorygnathus is also a key taxon at the base of Jianchangnathus + Pterorynchus + Darwinopteridae and Scaphognathus (which is basal to all remaining pterodactyloid-grade pterosaurs) and these also had smaller teeth. Padian, unfortunately, did not see the specifics, but reported very broad generalizations regarding pterosaur relations. Despite appearances, Dorygnathus is not so much related to Rhamphorhynchus, but both developed long procumbent teeth by convergence and share a last common ancestor near basal Campylognathoides and Eudimorphodon. [Actually many pterosaurs, including the SMNS 50164 specimen of Dorygnathus had a lower, longer snout along with the anterior displacement of the jaw joint. According to the large pterosaur tree Rhamphorhynchus inherited its long first wing phalanx from Campylognathoides and most pterodactyloid-grade pterosaurs and Dorygnathus do not share this trait. 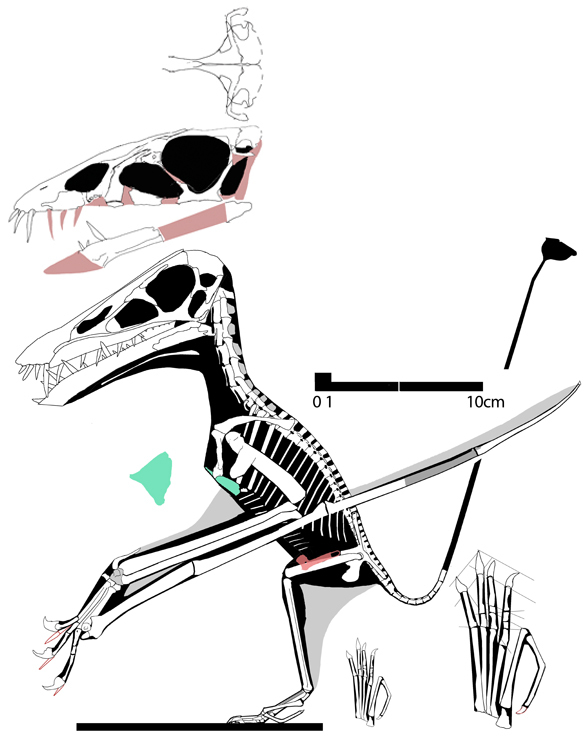 Likewise the partial reduction of the fifth toe in Rhamphorhynchus was inherited from Campylognathoides.] Dorygnathus retained an elongated pedal digit 5 with a bent p5.2. [Again, in this age of phylogenetic analysis, basing relationships on “appearance” is to be avoided.] Padian errors when he reports that all Pterodactyloidea has a long mandibular symphysis that is toothless anteriorly disregarding exceptions here, here and here. The nares are also reduced in the non pterodactyloids, Pterorhynchus and Darwinopterus. Pterodactyloids do not have a reduced antorbital opening. Some Dorygnathus and Rhamphorhynchus share this trait, but other Dorygnathus evolve a larger antorbital fenestra. Neither clades are 100% without a jugal posterior process. Figure 3. It’s better to trace bones accurately than to freehand reconstructions. Moreover, the quadrupedal pose Padian promotes has several errors (fingers not lateral, hands in front of shoulders, humerus over abducted). Currently no pterosaur tracks match Dorygnathus feet. The huge manual claws argue against a quadrupedal configuration. Padian, once the champion of bipedal locomotion in pterosaurs, must not have had much evidence to stand on if he has fallen so far the other way.